The D.C Circulator bus, costs $1 per ride, takes you in a circle around the national Mall. The disadvantage? You’ll take in the sights through regular bus windows, and the drivers don’t narrate your tour. However, ourDay tour of Washington D.C takes you to all the monuments, museums and memorials in the Capital city. 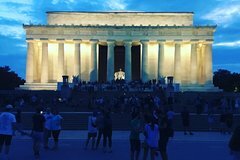 The tour is made for those who want to get the full picture of D.C. in 4 hours of live narrated bus trip with a skilled and informed tour guide. so, prepare for a trip through history with stops to the milestones that tell the story of this city.